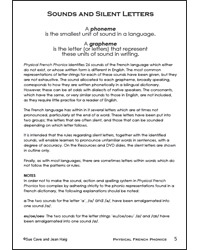 Physical French Phonics is a tried-and-tested system for teaching French phonics using sounds, actions and spelling. It has been developed over several years in conjunction with primary school children and their teachers. This resource is particularly unique in that most of the actions have been suggested by the young learners themselves. Through consultation and practice, these actions are the agreed perceptions of the sounds, from learners new to the French language. The representation of sounds through letters in any language should be seen as a code. It is hoped that Physical French Phonics will provide the key needed to break this code for all learners of the French language. Interactive whiteboard files for all the phonemes so, once you understand the system, you can make your own phonic resources to accompany any topic. Physical French Phonics has been developed for use with children at primary and lower secondary school (age 5 - 14, Key Stages 1, 2 and 3). Full teaching notes are provided and this is a suitable resource for a non-specialist teacher. 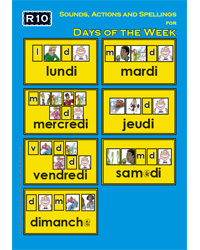 Click on the images below to download sample activities from Physical French Phonics.